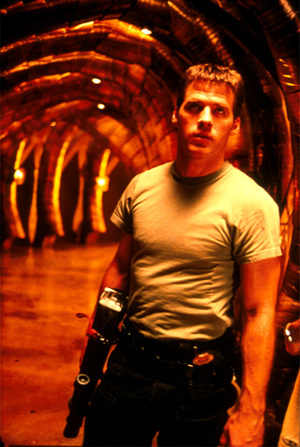 John Robert Crichton Jr. was born in North Carolina, about thirty years ago. His scientist mother was a strong role-model, and he was inspired to study physics. Chricton was equally inspired by his astronaut father. The first ever second-generation NASA astronaut, his earliest memory is of watching Neil Armstrong stepping onto the moon. Crichton’s father, Jack, was in line to take that first step, but he was from the Chuck Yeager/Test Pilot crop of early astronauts and was passed over in favour of Armstrong, a science educated astronaut. Jack never forgot this and to make certain his son didn’t suffer similar prejudice, he pushed young Crichton into the world of science academics. After high school, Crichton went on to MIT, ultimately achieving his full doctorate in Theoretical Sciences. When the opportunity arose to train with NASA as an astronaut, he leaped at it, and because of his strengths as a scientist, he was a popular Mission Specialist on several shuttle missions. Despite his astronaut status and tall, classic good looks, John still considers himself just one of the science nerds, like his buddies. His active, take-charge, hero characteristic--inherited from his father--has remained dormant, until that fateful day when he steps into his one-man capsule and ends up at the far side of the universe. 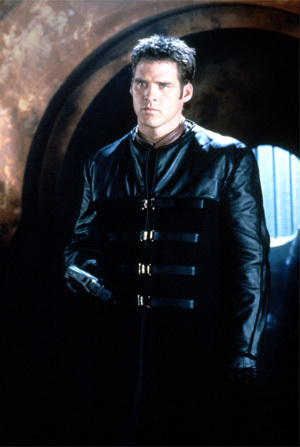 Crichton may not see himself as a hero, but like all of us, he has within him the making of one. All he needs is the opportunity for that side to reveal itself. Since being hurtled across the galaxy and joining a fugitive crew aboard a living vessel (Moya), Crichton has managed to survive many obstacles, including lethal confrontations with carnivorous and shapeshifting aliens. The difficulties he and the alien crew have undergone have forged a special bond between them all. They'll need that bond to survive. The merciless Peacekeepers, a military race, dog their every step, and Chricton in particular is their target.